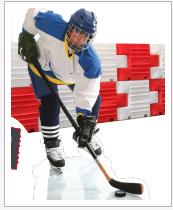 SoftLink is the standard in superior protection for Athletes. 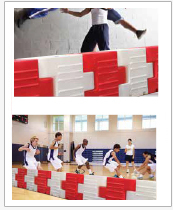 Why ISS SoftLink Safety Barriers protect Athletes so well. Why ISS SoftLink Safety Barriers make financial sense. Beyond the fact that the ISS Barriers take as little as 5 minutes to install, the other big reason I chose them was the cost. Unlike large universities, budgets here are tight and with ISS we were able to afford a better solution for less than half the cost. They get hit all the time—Every throw, every day! These guys are big and throw far, but the barriers always stop the shot. After 2 seasons, they’re holding up great and I feel confident they’ll last us for years. As the largest Calvary School in America with the oldest Rough Riding Program, we needed to create a 50’ Liberty Ring that was safe for both the students and horses who perform. KISS Barriers suit our purposes well. If kids fall on them, they don’t get hurt, and they are safe for the horses; no openings that catch. The barriers are easy to move—One team can set them up and tear them down in 5 minutes. After almost 4 years, the KISS Barriers are holding up good. We love the barriers as an efficient and effective safety measure to keep throwing implements inside the competition area. Our needs require us to set up and break down the barriers every practice session and this is done easily and quickly with as few as 3 people.